Celebrate Peter Cushing's centenary with the new issue of Doctor Who Magazine! "I only saw one episode of Doctor Who on TV, but I felt the character was unnecessarily harsh. I see him as a jolly old fellow – not sour at all!" “I thought the coolest thing in the world would be writing Batman, and it absolutely was… until the point that I wrote Doctor Who.” NEIL GAIMAN tells us about writing the recent episode NIGHTMARE IN SILVER! The votes are in for the 2012 Season Survey and the winners are revealed, including: Favourite Story, Best Director, Best Writer, and what was top of your wish list for the forthcoming 50th anniversary – as well as a chance to vote in our 2013 poll. The TARDIS takes the First Doctor, Vicki and Steven to a doomed alien world where a conflict rages between the survivors of two crashed spaceships, the Drahvins and the Rills in GALAXY 4. This overlooked serial from 1965 is the subject of this issue’s FACT OF FICTION, which reveals new and fascinating facts about the production. Doctor Who’s top man STEVEN MOFFAT answers questions from DWM readers, including how he times the length of episodes, and how would he feel about an American version of Doctor Who? DWM’s journey through the history of Doctor Who reaches 2008 and the show's thirtieth series in COUNTDOWN TO 50. Donna Noble becomes the Doctor’s travelling companion and together they encounter Sontarans, crazed Ood, Davros and Agatha Christie, and visit ancient Rome, parallel worlds, and the Shadow Proclamation. Chris, Emma, Michael and Will roll back the years when they sit down to watch THE LAZARUS EXPERIMENT from 2007. What will our trusty Time Team make of Professor Lazarus’ quest for eternal youth? The Promethians have won, mankind has been reduced to a state of barbarism and the Doctor and his friends Ian and Barbara are at the mercy of the Tribe of Gum. All hope is lost. Or is it? The Doctor has a plan, but is it already too late? Events reach a staggering climax in the sixth and final instalment of the epic comic strip adventure HUNTERS OF THE BURNING STONE, written by SCOTT GRAY, with pencils by MARTIN GERAGHTY. Columnist Jac Rayner recalls how she helped her children face the reality of death – both fictional and in reality in this issue’s RELATIVE DIMENSIONS. The Watcher tackles the thorny subject of Doctor Who mispronunciations in A History of Doctor Who in 100 Objects; presents a Grecian themed challenge to readers with The Six Faces of Delusion; outs another hapless Supporting Artist of the Month; and goes Wild with a list of Top Ten Westerns. All this and more in this issue’s hilarious WOTCHA! PLUS! All the latest official news, TV and merchandise reviews, previews, ratings analysis, competitions, a prize-winning crossword and much, much more! + Doctor Who Magazine Issue #461 is out Thursday 30th May 2013, priced £4.75. 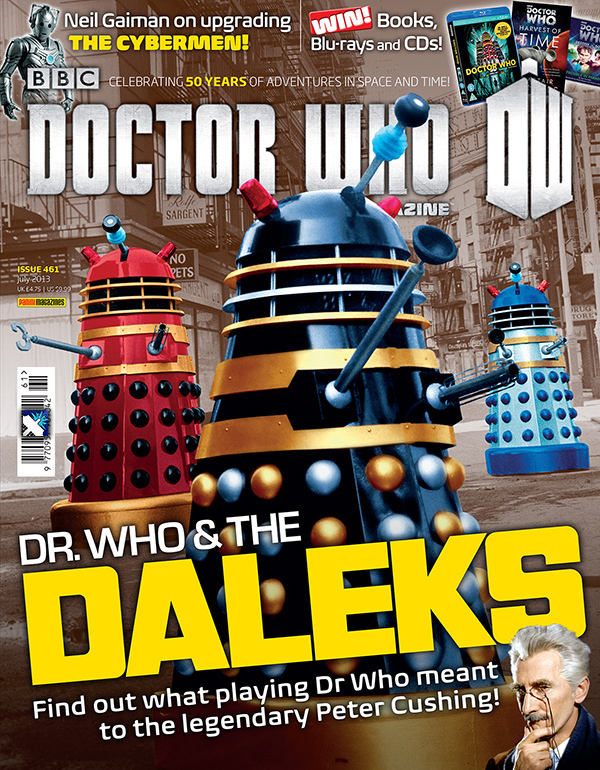 + Subscribe Worldwide to DWM from just £29.99 via CompareTheDalek!